Whenever my brain has been functioning recently, it has had to be applied to my studies. Although I was so incensed by the welfare “reform” (removal) happening in Britain that, as I’m sure you saw, I applied some on-the-planet time to the drawing together of some of the horrific details. I will come back to that topic when I can, but meanwhile I’ve been so limited on functional brain time that if I’ve found a while where I can think fairly coherently without getting a headache, I’ve been trying to piece together some writing for the next deadline. Some days I’ve managed to do this for half an hour or so but then I can spend the next two days not being able to think properly as a result. Consequently, my Castleville kingdom is coming along nicely! 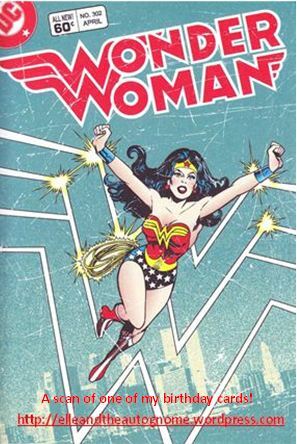 And inside it says: “… only instead of nun chucks they come armed with cupcakes”! I wouldn’t say that he was armed with a cupcake as such, but he did sneak upstairs to deliver a cupcake along with pressies and coffee! Despite my pain and brainlessness, it was a lovely way to start the day. In fact, we got tempted and went one better than that by having a cream tea in a little village café and then we had ice cream! 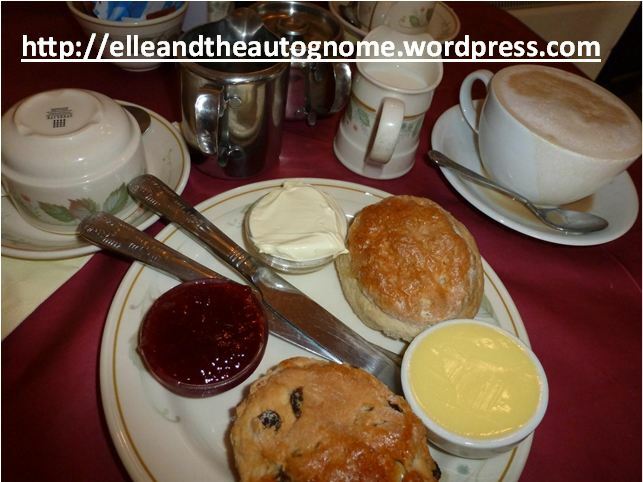 Unfortunately, with all the distractions of intense pain, gorgeous company, lashings of tea and the sheer joy of being out of the house… I didn’t notice that I’d left the cafe wearing some of the cream tea. 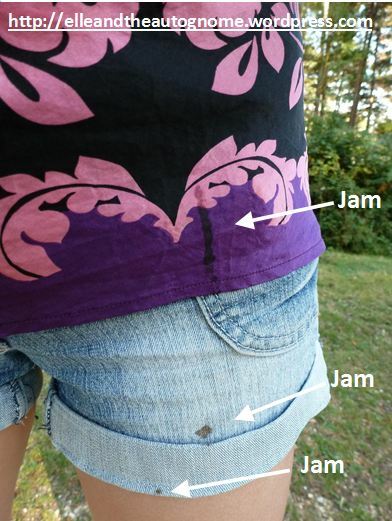 Wearing jam, to be exact! Hehe, I’m such a classy bird! This entry was posted in Doing things despite the Auto Gnome, Studying and tagged Be Yourself, Brain, Life, Magic Moments, Student by Elle and the Auto Gnome. Bookmark the permalink. Coated with India rubber, aren’t we just 🙂 I believe Castleville involves making lots of little choices, which do use dopamine; something to consider. Me, I rewatch Firefly, Jeeves & Wooster, and of course Tha Doctah. All the decisions belong to other people 🙂 I try not to waste a drop. But I do FB too much. That will change as wifi signals get worse. Haha, I do my best at bouncing back! It’s taken about a week for me to sort the pictures out and then I just did some of the wittering today… organisation and small bursts of effort! My brain is slipping away from me again now, I really am terrible at resting! Good point about Castleville. Although I tend to just click on stuff and do whatever pops up so I can let my brain coast along, that’s a ruddy good point! My all time fave for joyous relaxing with some televisual delights is Firefly. Recently I have come to change the way I think about my brain. It used to go with the near-fainting, but now the consistency of brainlessness as a result of thinking is really obvious, so my ways of working are changing as a result. 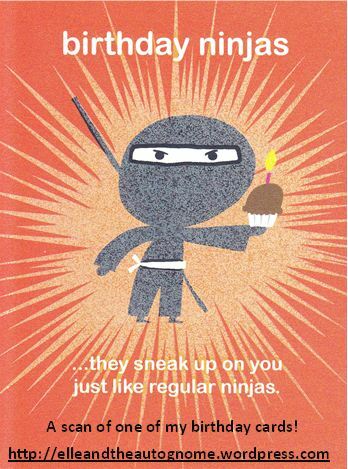 Life is not what I expected it to be at this stage, but there are unexpected cupcake ninjas so there are some plusses!